Into the Light on April 6, 2019 at Dupont Underground. Photo by Shannon Finney Photography. — at Dupont Underground. 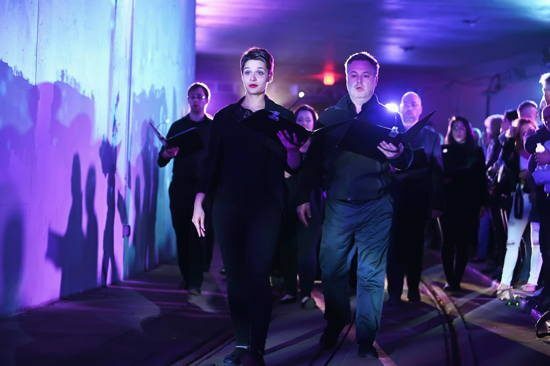 Choral Arts Society of Washington created a beautiful program for Dupont Underground, the creative and urban venue truly beneath Dupont Circle. It’s cavernous feeling space created gorgeous reverberations as the music moved throughout. The use of projections added an immersive element, a thing all the rage lately in visual and performing arts. It is quite effective in engaging the audience and creating a multi-sensory experience. The concert featured Choral Arts Chamber Singers, Choral Arts Youth Chorus, and New Orchestra of Washington. This wildly creative collection of artists devised a unique and intelligent audience experience in the Dupont Underground. Each piece seemed to flow almost seamlessly into the next. The program opened with some Early music by Hildegard von Bingen and then Gregorio Allegri. Then we jumped to the 20th and 21st centuries. The cornerstone piece at the center of the program “Different Trains” by Steve Reich was a compelling exploration of time and travel. It featured the Aeolus Quartet and recorded sound. The piece was a personal exploration for Reich of how if his family had not left Europe when they did to come to America, he would have ridden a very different train. It then explores how trains have changed and affect people’s daily lives. Partnered with compelling and emotional projections of World War II propaganda against Jews in Germany but also the Japanese in America as the third movement went on the audience was faced with projections of various issues from later in the 20th century to today’s top news. The program also included a new commission by Artistic Director Scott Tucker titled “The Moon and Her Maidens.” The piece was peaceful and compelling. It featured marimba expertly by Robert Schroyer. “Epitaph for Moonlight” by Murray Shafer is an eerily beautiful soundscape of a piece written in non-traditional notation. It is equal parts haunting and inviting. The use of projections allowing the audience to see the fascinating and complex notation was a clever choice on behalf of designer JD Madsen. The voices swelled and carried stunningly. This wildly creative collection of artists devised a unique and intelligent audience experience in the Dupont Underground. Hopefully, there are more performances like this. “Into the Light” by Choral Arts Society of Washington performed at Dupont Underground. For more information click here.